Dr. Fou is dedicated to bringing innovative technology and minimally invasive techniques for safe, early, and accurate diagnosis and treatment planning to the community. 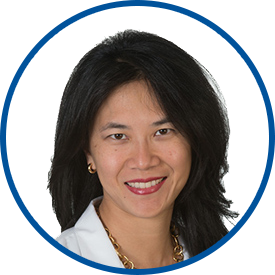 Overall, she aims to combine oncological principles with aesthetic planning in a multi-disciplinary approach with her colleagues to acheive the most satisfactory outcomes for her patients. Dr. Fou has a special interest in treating high-risk women and their families. She plans to continue to contribute to research in the cure for breast cancer. Need surgery - dr. very very communicating with me - called me personally about questions love. Exceedingly competent and caring, outstanding treatment. This care provider was the top of all doctors who I ever saw, by her kindness and compassion. I have already recommended this dr. I tell everyone how much I love WestMed. I have been a patient of Dr Fou for years. I am very pleased with her service and plan to continue my care with her as long as needed. Everything was good because I had my check up. always a good experience when I visit Dr Fou. Even when there were some issues last year. doctor and staff were professional and caring. *Dr. Fou - excellent doctor. Staff - excellent & kind & respectful. Dr. Fou is the absolute best. I'm lucky to have her as my doctor, I credit her for my survival, and I'm eternally grateful she was there when I needed her the most. Dr. Fou is awesome. She is very personable, professional, and really cares about her patients.